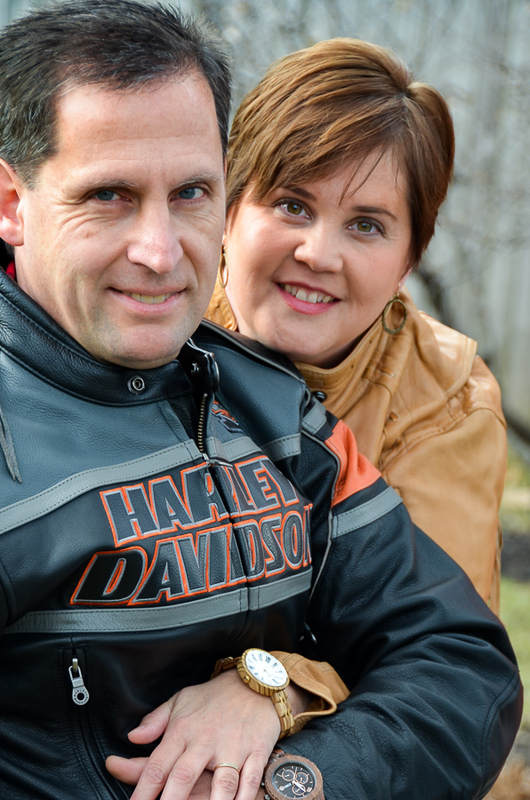 Many summers in the past 15 years have found us in the middle of some intense home makeovers. Including, but not limited too, pulling down old lath and plaster and hauling it out of the house load after load after load. But this year it isn’t us – it’s our neighbors right beside us. I felt their ambition, sweat, pain and tiredness as their pile of old wood, lath, plaster, linoleum, and who-knows-what-all grew larger. I hear the tools whining inside as they finish drywall, I see them covered in drywall dust. And I remember and I know JUST how they feel. One day I noticed something peeking out from their pile of trash. Something old, made of wood, and totally too cool to allow it to make the trip to the junk. So I rescued it from the trash heap and hauled it across the alley to my house. It was a lot more old, yellow, white than this pic shows. It was cut down at some point from its original size – hubby pounded some nails in a couple of spots he thought were coming apart too much. I liked the fact that it is paneled and solid wood. Here’s another shot of some of the stuff going on for this old door. It was sad and tired, and very much put out that it had been dumped on the junk heap. I could almost hear it sigh with contentment as the fresh new coat of Annie Sloan Chalk Paint was lovingly brushed on. And because I was much too excited about using AS chalk paint for the very first time I didn’t get lots of good in between pics. Here is the after. Happy and content with its new life! 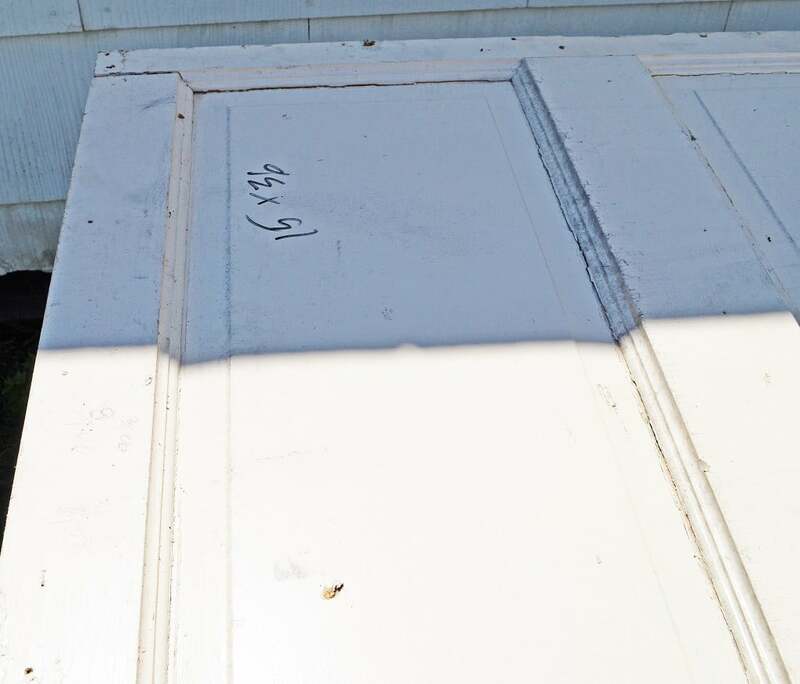 I cleaned the door up as best I could, using the garden hose and a bucket of soapy water and a rag. Then I let it dry in the sun. 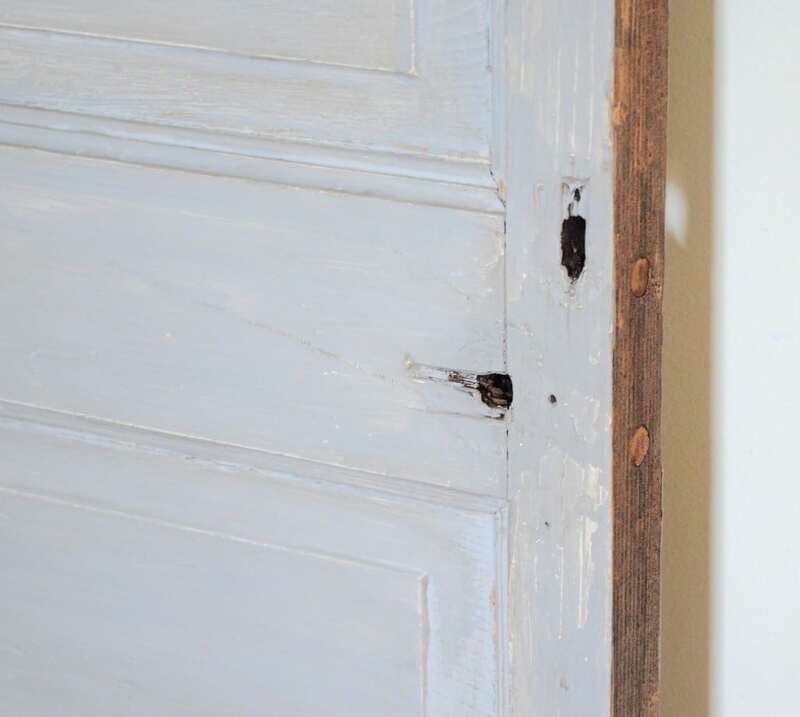 I used AS chalk paint – paris grey. I wanted a few darker spots but I had only purchased the clear wax. So I used a little dark stain I had on hand and rubbed it in a few spots and then sanded till it looked like I wanted. Not much sanding was necessary at all to get the look I was after. I should insert here that I really wasn’t sure what look I was after! I was so giddy about actually using the paint at long last, that I could hardly contain myself! I stained the edges of the door too just because I liked it that way. I didn’t put the paint on heavy but it did cover the writing on the old paint. I am totally in love with this paint. I can’t wait to use it on some other stuff. And I will be buying more colors – just for fun! 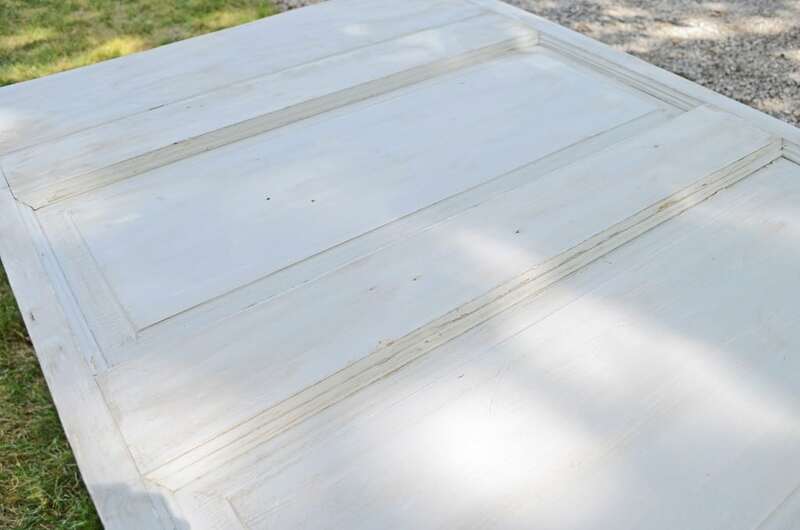 Have you used AS chalk paint? What do you like or not like about it? First off – love the door. I have one very similar to it in my garage with a full length mirror on it waiting for some TLC from me. We have a door just like it on one of my bedroom closets as well. 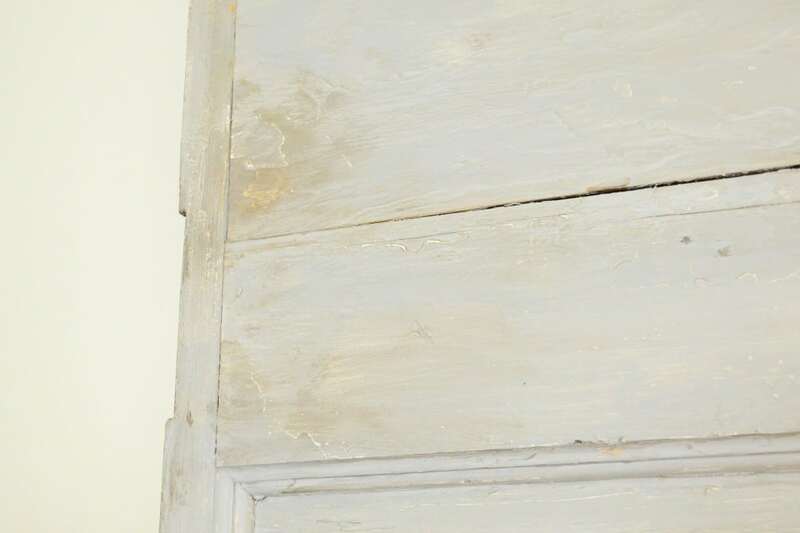 Question – what is the difference between chalk paint and chalkboard paint? I was reading the whole time thinking chalkboard paint but then you mentioned waxing and with that light color Ima thinking you’re not writing on it with chalk? Aaaahhh so fun to see your experience with chalk paint….looks great! Glad u like it! SomedAy I too will get around to trying it out. you know I love me some ASCP!! And I really love that DOOR!!!! nice find, Jill!! Thanks for joining us in the Bloglovin’ Blog Hop. So great to have you! I love it and I am fascinated with the whole chalk paint thing. 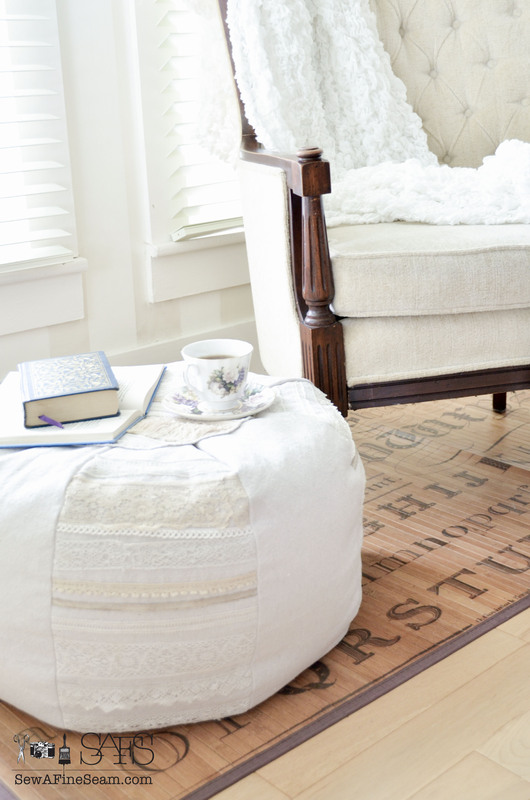 I keep hearing about it..
Love these re-purpose projects! Fantastic outcome, looks beautiful! Thank you Melissa! It was rather fun to dash across my alley and pull this door from the trash heap!! Thanks! I love how it turned out and can’t wait to have time to make another piece of furniture smile! I’ve never used AS chalk paint before. BUT, if it can transform something so beautifully as it did your door, I think I want to try! AH!!! That sounds like a really fun thing to do! Do you have room for me to ‘crash’?!!! Jill, wow, what a great score! (And free is always good! 🙂 I have yet to try the A.S. paint, but so many people seem to LOVE it! Your door looks fantastic! Thanks! As much as you ‘love junk’ and have so much great stuff you really should try this out sometime!! It opens up a ton of new possibilities!! Thanks Judy, I am so happy to have finally used AS chalk paint! Great job on the door!! I adore ASCP and have lots of color although I haven’t yet gotten the new color: Florence. I really, really want that one! It’s a bold turquoise and I am completely in love with it! I love a bold turquoise! I am planning to set a pop-up shop at some point and I want all my props for my handmade stuff to be for sale. So I’m hoping to thrift some furniture and paint it up! Some fun color will be great! 🙂 Thanks Christine – glad you like it so much! If I decide it has to find a new home I will keep you in mind!! This looks great. Thank you for sharing this at Saturday Show and Tell. I can’t wait to see what you have for this week! I look forward to seeing you there. Thanks Mackenzie!! It was fun to finally use AS chalk paint! Thank you Kathryn! I will check out your blog! Your vignette turned out so pretty. I love the door and how it turned out! I have been looking for a vintage dress form forever, one day I will have one! Yours is very nice! My fingers are crossed you’ll share your creative inspiration tonight with Sunday’s Best – sharing is a good thing! thank you Cathy! I will be over to check out your blog soon! Thanks for coming by and leaving a comment! 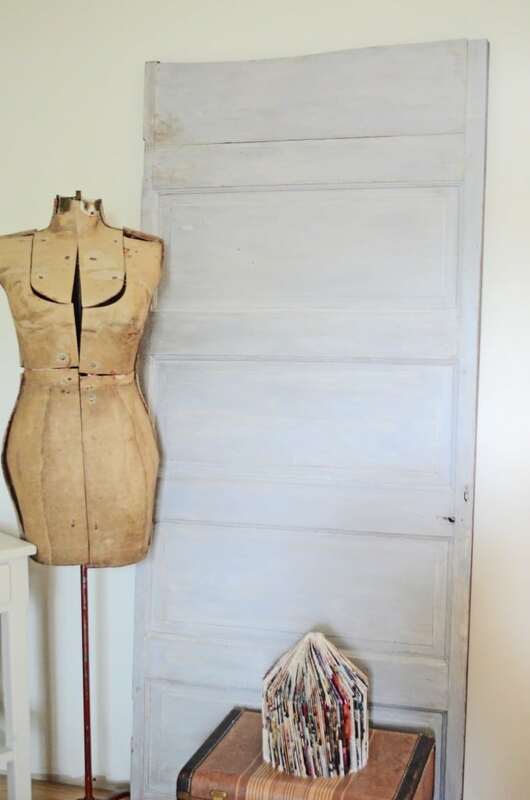 Love the door, still want one, and a dress form! Tickled you shared your creative inspiration with Sunday’s Best – your creativity helped make the party a success!